As Jonathan I were walking back along the road, I heard a bird call that I did not recognize. It was a single note call that would last for a second or two. It occured enough times that I stopped to investigate. 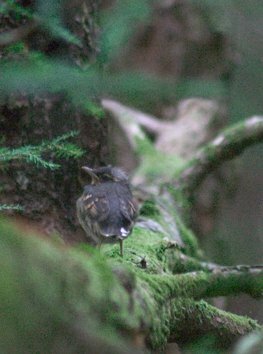 Not too far into the woods I was able to see it and recognized it as a varied thrush. The call did not have the characteristic buzz that I generally associate with the varied thrush. This particular bird seemed somewhat wary of me, but not nearly as much as most varied thrushes I have encountered.